Susie added, “Three days later I was on a plane to L.A. and three days after that I opened with the girls at the Coconut Grove. We were the opening act for Frankie Valli and the Four Seasons. It was at least two months before my nerves and excitement settled down and it really hit me that my big break had happened. It really was a dream come true!” Besides the call that Susie was chosen to become a Golddigger, her most memorable moment was the first day she met Dean Martin. Another thrilling moment was her first Bob Hope U.S.O. experience. “Touring the bases overseas and entertaining our troops was as uplifting as it was exhilarating,” Susie recalls. The Dean Martin Show undoubtedly falls in the category of the ‘Golden Age of Television’ and Susie feels privileged to have been a part of it. 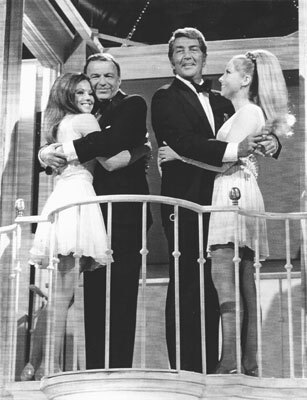 In addition to her 5 years with the Golddiggers, Susie was chosen along with three other Golddiggers (Wanda Bailey, Tara Leigh, and Michelle Della Fave) to form a smaller group called ‘The Ding-a-lings.’ Most notably, they appeared with Frank Sinatra on what became one of Dean’s most famous episodes: New Year’s Eve 1970. After leaving the group, Susie went on to do commercials, movies, and T.V. She also performed in Vegas with Jack Cassidy and Shirley Jones in their act, and with Jack Albertson’s act. She met her husband, Bill Ewing, in 1980. He was her acting coach. They were married in 1982. In 1984 she danced in her last show, the opening ceremonies of the Olympics. She found out one week later that she was pregnant…then eight months later their son, Blake McIver Ewing, was born. Following in his parents’ footsteps, Blake began a career as a singer and actor. At age six he won Jr. Vocalist Champion of Star Search. Since then he has gone on to do television, movies, stage, and recordings. Susie’s husband Bill continues to work in the film industry and after fifteen years as Senior Vice President of production at Columbia Pictures, he has now found additional success as an independent producer. Susie is thrilled to be onstage and in front of the camera once again as the Golddiggers launch their highly anticipated comeback!!! She looks forward to what the future holds for the group!